Takeno Snorkeling Center was created by the Ministry of Environment to educate on nature and the environment. 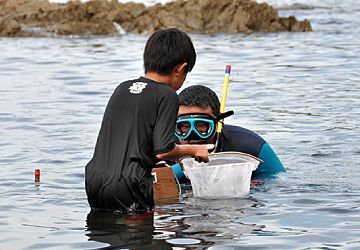 Volunteer staff run marine life observation classes both on and off shore as well as observation of the underwater environment using snorkels. The center is open year round and is a leading visitor center for nature observation. 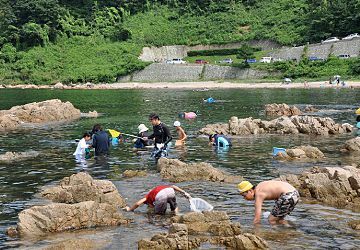 It is especially popular from early to late summer when school children and people come from all over to view the underwater world. There are a variety of programs available such as snorkel classes with instructors, nature observation sessions, and more. Take a hands-on course to learn about local marine life and the geography of the coast. The tide pools and shallow waters just outside the visitor center is the perfect place to find an array of fish, starfish, octopus, and more. You can rent equipment from the center if you do not have your own. Sturdy water shoes or sandals should be worn to protect your feet. Inside the visitor center are displays and dioramas with information on types of wildlife, sea life, and rock formations that you might see while exploring the area. 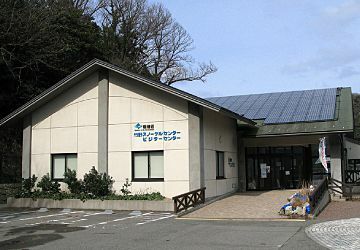 This is the main building. You are welcome to use the parking lot when visiting the center. Just below and next to the center is the snorkeling area and the Sea of Japan. 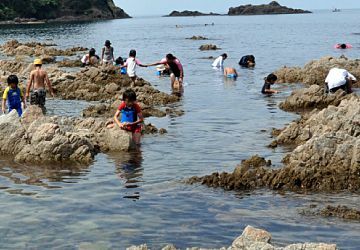 Children enjoy searching through the shallow waters for colorful fish, octopus, crabs, sea urchin, and more. What can you find? Just past the rocky tide pools and shallow area, there is slightly deeper water for the more experienced snorkelers and swimmers to explore. You can also take a break from your adventures along the beach. A child uses a type of underwater viewing bucket to look for fish without having to put their face into the water. Closed every Wednesday from October to March. Free admission to the visitors center. Times: Morning course from 9:30am / Afternoon course from 1:00pm, about 2 hours. *Course and lessons are subject to change. Please check with the center directly in advanced. To get to Takeno Snorkeling Center, you can drive or take public transportation. If you are taking public transportation: Take the San-In Line local train bound for Kasumi. Get off at Takeno Station, from Takeno station it is about a 1.5km or 20 minute walk.